These are words that educators, researchers, and students use to talk about reading and learning to read. Lexile -- a unit of measurement of a student's reading ability or the difficulty of a text. A Lexile measurement is written as a number followed by the capital letter "L" (for example, 1025L). For more in-depth information about Lexiles and how they are calculated, click here. Lexile range -- Students reading books within their Lexile range are able to comprehend about 75% of the text. This means that there is a comfortable level of challenge, so students will be consistently learning new words and working through complex sentence structures at a level that isn't overwhelming. Students who read below their Lexile range will often find the book too easy; students who read above their Lexile range may struggle through the text. However, the amount of background knowledge and motivation a student brings to a reading task will also affect comprehension ability (see text complexity, below). --> To calculate your Lexile range, subtract 100 from your current Lexile. This is the lower limit of your Lexile range. Next, add 50 to your Lexile. This is the upper limit of your Lexile range. (To illustrate, a student with a Lexile of 1050L will have a Lexile range of 950L-1100L). When your Lexile increases, your Lexile range must be recalculated. what they read, but not so challenged that the reading task seems impossibly frustrating. phonemic awareness -- the conscious awareness and knowledge that words are composed of separate sounds (called "phonemes"). Phonemic awareness is the awareness of sounds only. Phonemic awareness is essential to learning to read in languages that use alphabetic writing systems, such as English and Spanish. Students who do not have phonemic awareness will find phonics difficult to learn. text complexity -- factors that help to predict how difficult comprehension of a text is going to be for a given individual. 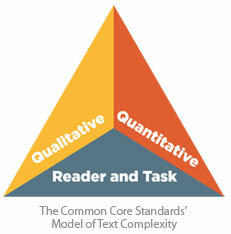 Text complexity is made up of three components (as shown in the graphic below): qualitative measures, quantitative measures, and the relationship between the reader and task. Teachers must examine each of these components to determine whether a text is a "good fit" for a class or an individual student. Teachers can also examine each of these areas to decide what extra supports students will need to be able to understand a text (lessons on vocabulary or historical background, for example, can help to support student comprehension of a required text). --> Qualitative: How long are the sentences? Does the author use everyday or more technical or archaic vocabulary? What is the author's purpose? Is the meaning clear, or must much of the meaning be inferred? reader to learn about the topic?